My sister and I complement each other’s food tastes like the Yin and Yang. It used to drive our mum crazy, especially when she used to fry eggs for breakfast. I’ve never liked and still cannot bring myself to eat runny yolks. My sister couldn’t stomach the whites. 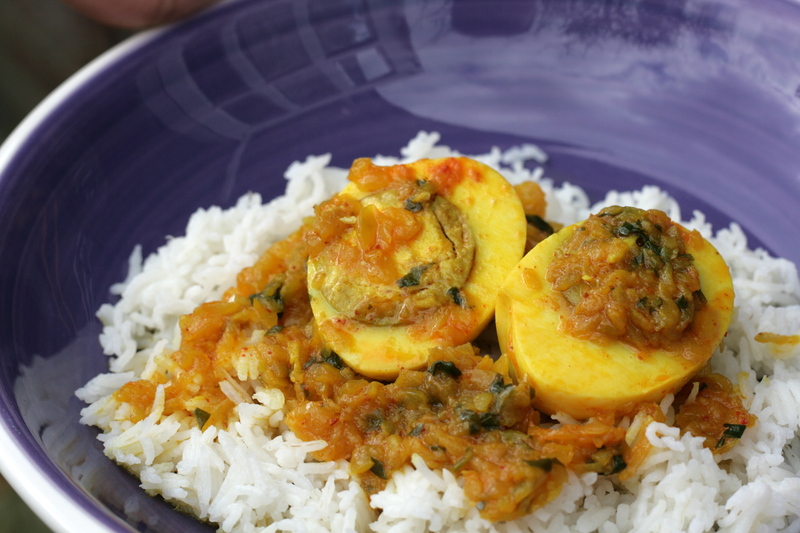 It was the same with this egg curry. We loved it despite our complicated relationship with the main ingredient. The best solution was to trade our favourites bits of the eggs and eat what we liked best. The swap was messy and had to be managed quickly when mum had her back to us, lest we get told off. Not much has changed till date! This is still my favourite rainy day recipe – served steaming hot and in my case, minus the yolks. With yolk and without – take your pick! 1. In a large bowl, throw in the onion, garlic, coriander, chilli (if using) salt and the spices. Pour the oil over. 3. Heat a shallow pan. Add in the onion and spice mixture. Saute for a couple of minutes on a high flame. Then, cover the pan with a lid, lower the heat and let the mixture cook for about 7-8 minutes. 4. When the onion is almost cooked, add in the boiled eggs. Pour some of the curry over them and let it all simmer together for 2-3 minutes. 5. Turn off the gas and serve hot with phulkas or rice. 1. This serves 4 as a side dish. 2. *Sambhar masala is a typical Pathare Prabhu garam masala. If you don’t have access to it, you could use regular garam masala with a little roasted besan (gramflour) added to it. 3. The vegetarian version is usually made with potatoes or potatoes and peas. Omit the ginger- garlic for this version, if you wish. Here is one that I make for the husband. This entry was posted in A-Z Blogging Challenge 2015, Curries (Kaalvan, varan, sambhare etc. ), Gravy dishes and tagged #AtoZchallenge, Egg bhuzane, egg curry, epicurious, Maharashtrian egg curry, Mumsnet Blogging Network, Pathare Prabhu egg bhuzane. Bookmark the permalink. Yum! I love it with the yolk! 😀 Loved the picture too. 🙂 my sister agrees with you, Sanch. Thanks, Rajlakshmi. The sambhar masala is our garam masala. It’s not the one used in South India. Ah, it looks like I’m in the minority then. Wow, that looks delicious! I want to try making that! Thank you for stopping by. 🙂 I do hope you try it. It’s a good use of all the Easter eggs. I’ve never tried egg curry, but it sounds delicious. Thank you for sharing this mouth-watering recipe! Thanks for visiting, Laurel. Glad you liked it. Thanks for visiting. Glad you liked it, Archana. Hey I like egg yolk and the recipe sounds delicious. Thanks, Tulika for all you comments. Will reply to them. In the meanwhile, just wanted to let you know that I have un-spammed you. 😉 Not sure what went wrong here. Hi…loved your recipe but where can I get your masala PP sambhar masala? Hi Rashmi. Thanks! Where are you based?